The Camille kayak is the product of long experience in both sailing and kayaking. My earliest fascination in life was for sailing: I loved the feeling of moving through water without noise, without pollution, without much physical effort; and all this using a clean and free energy. My second fascination was for kayaking – sliding through the water silently, on a forward facing seat, with no concerns about draft and clearance, and being able to reach areas that couldn’t be reached in a sailing boat or even in most power boats. Kayaks are light and easy to carry by car so you can explore thousands of miles of scenic coastal areas and inland waters. And how was I going to sail a dinghy when there was no, or too much, wind ? And why should I have to paddle so hard in a kayak when I could press on with sails at twice the speed and with much greater comfort, safety and sailing range ? Klepper in Germany, as far back as 1907, Chauveau and Lapon In France from the inter-war period till 1970, all sold kayaks rigged with gunter rig and lugsails (sometimes with jibs) and equipped with lee boards and rudders. These craft were built with a wood frame (nowadays aluminium and composite) and covered with a stretched “skin” like Eskimo kayaks. They were also foldable, so they could easily be carried by train or car to where they would be sailed. In that way thousands of kayakers enjoyed wonderful holidays along the Dalmatian coast, around Corsica, and in other waters all over Europe. When I was a kid I sailed on a Canadian canoe rigged with lugsail. And later on I enjoyed navigating a Lapon kayak (bought in 1975). That was also rigged with a lugsail, and she had real qualities: good lateral stability, good steering stability while underway, as well as being fast and pleasant under sail. But I quickly gave up sailing that kind of boat. In spite of the builder’s claims, assembling the hull was a long and tedious job. It was worth it for a camping cruise of several days but certainly not for a one day outing. Moreover the “skin” was easily pierced by rocks at the second outing on a river. The seat was uncomfortable within a few hours. 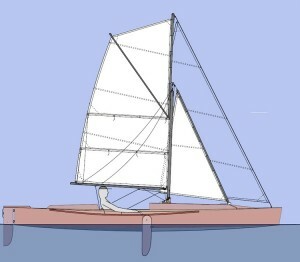 The cockpit was far too narrow for counter heeling, so that the boat had to permanently carry far less sail area than she was capable of so as not to capsize in squalls. Lee boards in their upright position impeded paddling movements. Lowered rigging and sails cluttered the cockpit and impeded paddling. At that time I lived in an urban flat with no room to store a boat. So I bought several inflatable kayaks with sails. I was particularly fond of the Austrian GRABNER kayak I bought in 1985. She had a sharp bottom hull, which was strong, stable and comfortable. With her, I had decades of beautiful outings in the coastal and inland waters of France and Portugal. But like other kayaks she suffered from a cockpit cluttered with rigging and upright lee boards when I was using the paddles. The basic drawback of all these kayaks is to have been designed exclusively for paddling, and then to have been given rigging and sails, but without any change in the original concept. This is why after years of vainly pacing around the aisles of the Paris Boat Show, I made up my mind to design and build the kayak of my dreams. My first freehand sketches were drawn in August 2005.Then I used 2D PowerCadd 6 software to make a “fair copy”. But I rapidly realized that I didn’t have the training or computer skills to design a boat. My training and practice as a “ground” architect was useful for space design but not for matters such as hull design, mass calculations, hydrostatics, hydrodynamics, wave resistance, and so on. I also quickly found out that a 2D software was handy for sails design but not so useful for hull design. So I enrolled as a student for a DPEA (Diplôme Particulier d’Architecture Navale) at the ENSAPLV (Ecole Nationale Supérieure d’Architecture de Paris La Villette) in 2009. My teachers were naval architects: Christophe Barreau, Frédéric Neumann and Gérard Chenus. Camille was designed using PowerCadd and Rhino (3D) software to satisfy my degree requirements. I graduated in June 2010. 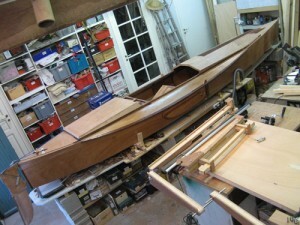 I was then ready to start the construction of this kayak that no boatyard felt like building, mainly due to never having seen one before, doubts about there being a market for such a craft, and alleged building difficulties. So I built her myself. Part time construction lasted three years, about 1,500 hours in all, mainly due to my lack of experience in boat building and the novelty of the problems I faced (essentially ones of how to handle everything from the cockpit). Moreover, naval hardware sold by ship’s chandlers was frequently of no use whatsoever. However I was able to build her without too much difficulty by using simple building methods, hand-held tools, and great care. 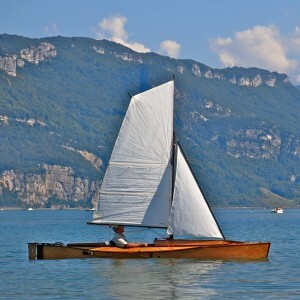 Camille was launched in August 2014 on the Lake du Bourget in French Alps. We are very happy together!